Tax Increment Financing works in North America, but to be a success here would require a reform of local government. The penny is beginning to drop that Ireland is one of the most centralised countries in Europe and the debate has begun in earnest for democratic reform. This can be seen in discussions surrounding the DA?il and the number of TDs, what they do and how they do it. The very presence of the Seanad is under threat from the main parties. The operation of local government is also under scrutiny. Whatever might or might not happen to the DA?il and Seanad, reform at local government level is very likely. 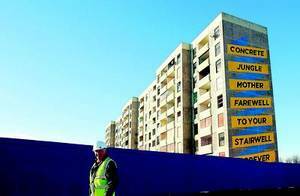 Is private funding the future for regeneration projects such as Ballymun? Central and centralised government has arguably been responsible for much of the current economic debacle. Hence, the role of local government will be reassessed to see if affording greater power to the regions and local authorities a�� existing or newly reformed ones a�� could result in more efficiencies, better democratic procedures, and more locally responsive authorities. That’s the theory anyway. Local government control over the raising and spending of its own finances above and beyond commercial property rates will be central to any debate about reform of governance. Reduced public finance available for infrastructure and regeneration developments, coupled with reform of governance, will lead to the need to explore new strategies for raising public funds. In the UK a�� and particularly in Scotland a�� this search for new ways to fund local development has led to an exploration of a concept known as Tax Increment Financing (TIF). TIF is not something new. It has been bandied about in various guises for many years. Around since the 1950s in the US, and popular in places like California and Chicago, TIF is a method of raising private finance for public infrastructure or development. Funds raised this way are repaid by future increases in local tax revenue from the improved facilities. We need something like this. In 2007, Ireland ranked near the bottom of a 17-country European table in physical infrastructure. We were also near the bottom in the business-performance category. Ireland’s global infrastructure ranking has since improved, but at the same time funding has dried up, with spending on it due to be cut by a��3bn to a��5bn over the next four years. Infrastructure does produce results. In Britain, for example, it is estimated that every A?1 invested in infrastructure produces A?10 worth of benefits in business support and job creation. These projects are typically done as a joint venture between the lender and local government. Competence, both professional and elected, at the local government level is a prerequisite for the successful operation of TIF. They are long-term projects and can be complex to manage. For this reason, such a scheme should only be introduced in tandem with fundamental local government reform. A scheme of revenue raising that commits an area to repayments for many years needs to be introduced and implemented by people who will act in an open, competent, honest and considered way. Gombeen-ism and clientelism has no place when the long-term stakes are so high. TIF is most likely to be successful and appropriate in larger metropolitan areas. In Ireland, this probably means it would only work in the Dublin, Cork, Limerick and Galway urban areas. Smaller areas will have less potential to raise income post-completion, and will have even less potential to attract lenders. Practice so far has seen the potential value of projects capped, typically at around the equivalent of a��600m. Crucially, a proper consideration of risk sharing is key to TIF; specifically, it involves commitment to the idea that if lenders are providing capital at a rate of interest which includes a premium for risk, then if the project fails to deliver expected returns they must take their share of the financial losses. Lenders will have done their research, calculated the figures and costed accordingly. If they lose, they lose. It can only exist as part of a new fiscal system of local revenue generation and such changes, in turn, will require reform of Ireland’s property markets. In the residential market, this will involve production of the long-awaited register of property prices. On the commercial side, it may mean the adoption of European-style shorter leases with more frequent rent reviews pegged to inflation rather than the market. It may also involve a modernisation of commercial rating practice. Transparency in transactions and valuations a�� or the lack thereof a�� has been a massive issue in the last decade. This is particularly pertinent when it is the taxpayer who will reap the rewards, but also foot the bill, as with TIF. Ultimately it won’t solve all our urban regeneration ills, nor provide all needed infrastructure, but is worth considering. Central government hasn’t exactly covered itself in glory in the last few years, so perhaps it is time to return some power to the people at a local level. This entry was posted in Uncategorized on February 25, 2011 by David O'Connor. Enjoyed this piece very much. However, since TIF relies on the prior existence of property taxes, it’s worth thinking about what type of property taxes we want to implement. Labour, Greens and Fianna Fail were all in favour of a Site Value Tax, which is based on the value of the land, not the building. For a wide variety of reasons, it makes sense to go for a land-based tax, as it doesn’t penalise investment in building maintenance and improvements, creates incentives for efficient land use, and most importantly for TIF, captures the value changes to land prices caused by infrastructure investment. See: http://smarttaxes.org/site-value-tax/ for more info. Local authorities could still go borrow against projected revenue increases, but a Site Value Tax will be much fairer and more effective than a simple property tax.